There is an art to life, highlighted and at times shadowed with its uniquely pleasing quality. This section of my website features aspects of life that are enjoyable, helpful, and inspiring. I feel blessed to have experienced the sentiment found in the great poet’s words; there are times when the most unexpected things in life are stumbled upon when we take the road less traveled. Such was the case when my family and I decided to take a trip to the Amana Colonies a few years ago. In the Southeast corner of Iowa sits a quaint little village of times past. If you were to Google the top 100 vacation destinations in the U.S. it is unlikely that this terrific tourist destination would make the list. For us, it was the vacation less taken and a time we will always treasure. During our journey, we discovered an interesting part of American history, but we also had the immense pleasure of being introduced to artist Dena Tollefson and her beautiful paintings. We were so captivated by her work, we could not resist taking home a couple of her pieces. To this day, when we look at her creations, which hang proudly in our home, we remember a very special time and a very gifted artist. Born in Cedar Rapids, Iowa, Dena discovered at a young age a love for art while painting alongside her mother, Helen Schaefer. One year, a professional watercolorist visited her elementary school and quickly took note of her abilities. Excited about Dena’s talent, the artist began giving her one-on-one lessons. All was going well until her practical parents learned that she was being pulled from math class to paint. Wanting the best for Dena, her parents quickly turned her toward math and science, encouraging her to first lay her life’s foundation with a solid career. Upon graduating high school, Dena enrolled in Iowa State University to study engineering. Unable to put aside her love for painting, she continued to pursue her craft part-time, as a release for all of her pent-up creative energy. For a decade she continued to work as an engineer by day and a painter by night. Her talents paid off when her paintings began selling in galleries. Her continued success paved the way for Dena to leave the corporate world of engineering and to become a full time artist. As a self-taught contemporary colorist, she designed her own signature technique of painting called “Daubism.” When I met Dena at the Amana Colonies, I mentioned how her work reminded me of pointillism, but on a more vivid scale. 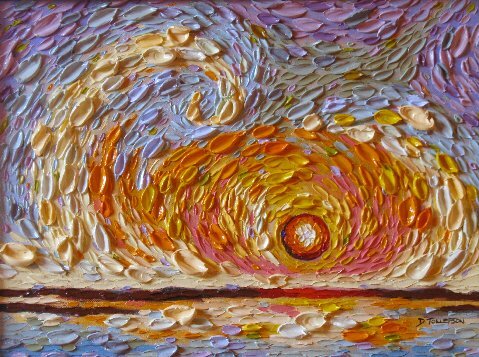 “Daubism” is a process where hand-mixed oils are applied with a palette knife. Her Artist Statement below does a terrific job of summing up her technique and wonderful talent. I employ vigorous brushwork and texture through the palette knife in my work so that people may experience, along with me, the "feel" of the painting. I find mosaics fascinating, how the individual pieces all contribute to the whole—I want my paintings to have a similar idea where overlapping petals of paint all stand on their own and then contribute to the total . 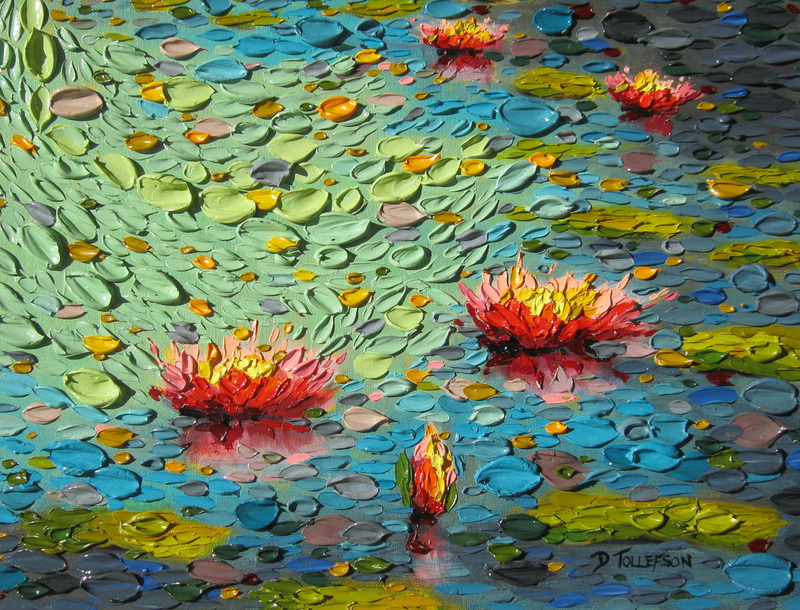 . . My work known as "Daubism" is created using a palette knife where each stroke of color is isolated from the others. Most paintings will have hundreds of different colors; these colors are all individually hand-mixed from a limited set of colors creating unique colors which relate to one another. I am striving for a sensual, tactile surface in paint. Below is a listing of Ms. Tollefson’s collections and gallery representation. Cedar Rapids Museum of Art, Cedar Rapids, IA. St Luke’s hospital, Cedar Rapids, IA.